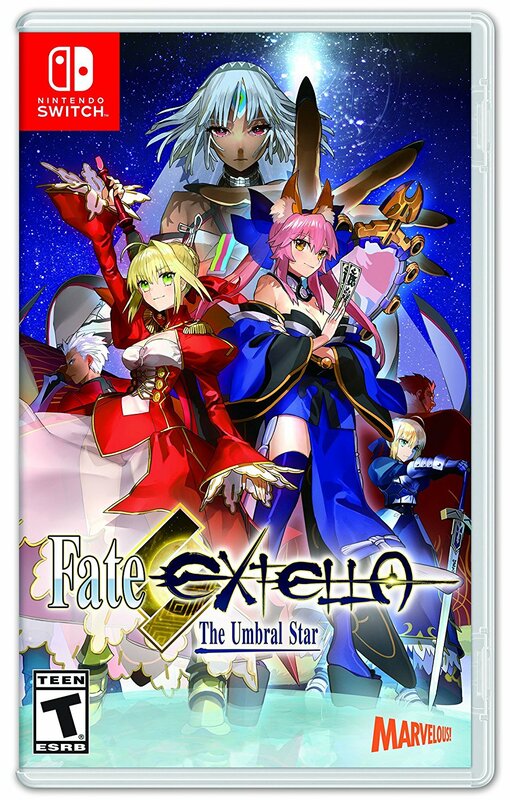 It’s a good time to be a Fate fan, with Fate/Grand Order recently released in the west for mobile devices, the currently-airing adaptation of the Fate/Apocrypha light novel, Ufotable’s upcoming movie adaptation of Fate/Stay Night’s Heaven’s Feel route, and the release of the Steam and Nintendo Switch versions of Fate Extella: The Umbral Star. The latter is what we’re taking a look at today, and if you’re more interested in an opinion on the game itself than the porting job you can see our review of the PS4 version here. The Switch version includes all the original versions’ DLC, as well as the new Unshackled Bride costume for Nero. It runs at 720p, both on the console screen and in docked mode. I mostly played the game in handheld mode, only having spent a brief time playing it docked. The game runs smoothly and consistently, and I never encountered any performance issues even in crowded levels. I assume the Switch version is an upscaled port of the Vita version, hence running smoothly even on the less powerful hardware compared to PC or the PS4. To be fair, combat doesn’t exactly translate well into screenshots in this game. It should be noted that I’m not overly familiar with the Musou style of game. My main experience comes from what I’ve played of Hyrule Warriors, and the only other things similar that I’ve played are Senran Kagura: Shinovi Versus and Estival Versus. I’m mostly coming into this as a Fate fan, although I also haven’t played all of Fate/Extra which is a prequel to this game. 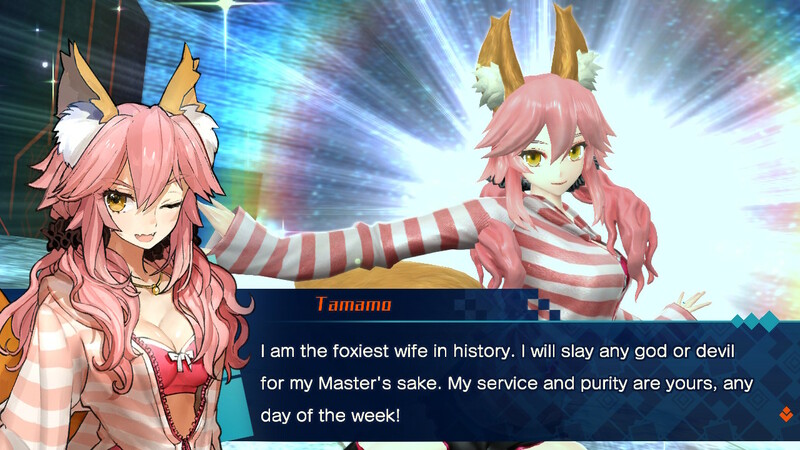 Unfortunately Fate/Extra CCC, the game between this and Extra, never released in the west. However, your servant Nero helpfully gives you a rundown of the events in the previous games at the start of the first of the three routes. Fate/Extella on Switch works the same with all control configurations, but I personally found it odd using the Joy-Cons separate from either the grip or the console itself, but that may be the fault of my hands being too large for the tiny controllers. Everything is generally clear on the small screen, although the screen size doesn’t help the camera issues. Similar to Senran Kagura: Estival Versus, Fate/Extella suffers from issues with camera control. They aren’t quite as bad here, largely due to the more open levels and the camera never getting stuck in place, but especially when locked on to an enemy servant it can sometimes be difficult to keep track of the action. I’m not particularly well-versed in the Musou style of game, but it seems like this is rather a pervasive issue within the genre. Seems like a pretty good offer to me. 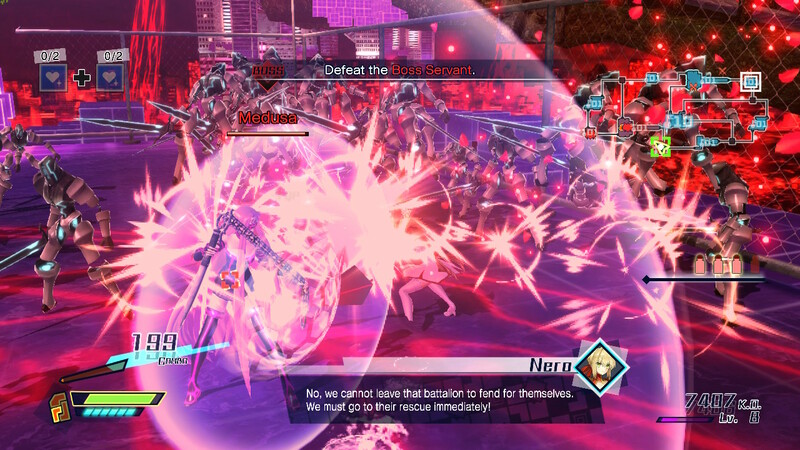 If you don’t like the Musou genre, Fate/Extella likely won’t do anything to change your mind. 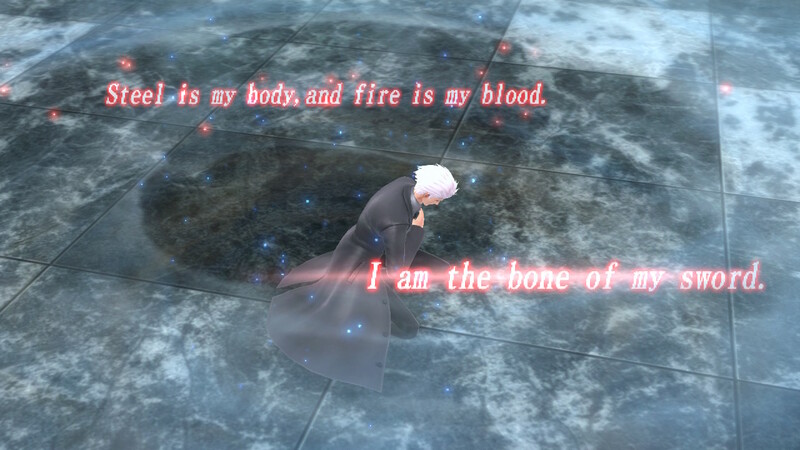 Likewise, if you go in knowing nothing about Fate you’ll likely just be confused about everything, since it doesn’t do a particularly good job of explaining the series’ premise to newcomers outside of the in-game glossary. The gameplay is fast and fluid, if not necessarily overly complex, and the install skill system allows for some rather serious min-maxing of your servants’ attributes. There’s definitely fun to be had in the gameplay on its own, but with the visual novel components making up a rather significant portion of the game, those out of the Fate loop will be somewhat left behind. Woah, cool your jets there, Nero. Fate/Extella: The Umbral Star looks quite nice in both handheld and docked mode, although the character models sometimes have an unusual blurry glow effect that becomes more pronounced on a larger display, while being almost impossible to see on the Switch’s own screen. The rather lengthy (20-40 minutes) levels can be somewhat awkward for play on the go, but otherwise I’d recommend handheld mode if you pick this version up. It’s worth noting that the Switch version is the most expensive – $59.99 USD compared to $49.99 on PS4 or Steam and $39.99 on Vita – but the Switch version includes the DLC costumes that cost extra in the other versions, as well as the exclusive Unshackled Bride outfit for Nero. The DLC may make this version worth it to some, while others seeking only portability may prefer the less expensive Vita version. The Switch version certainly isn’t the most technically advanced version, and those looking for that may prefer the PS4 or Steam versions. However, this version provides the versatility of the Switch, while also being the most complete version for its price. It provides the same 30-ish hour experience across the three arcs and various side stories in a versatile, complete package.